If anything is certain on the eve of SA’s fifth democratic election it is that nothing can be taken for granted, not least of all the sanctity of our young democracy and its constitution, under the rule of the existing elite. Whatever the election outcome, significant trends are converging towards more cataclysmic scenarios where an increasingly beleaguered ANC and its government and the forces of the poor it claims to represent come into head-on conflict. The ANC leadership and government are not a curious and comical shower which will pass. They are the shape of things to come. Neither liberal outrage, nor constitutional challenges, nor appeals to decency and common sense, will change the situation. They are totally indifferent to all that. The ANC is firmly in the grip of the Zuma-Ramaphosa-Nzimande cabal and nothing from inside the ANC will change that. 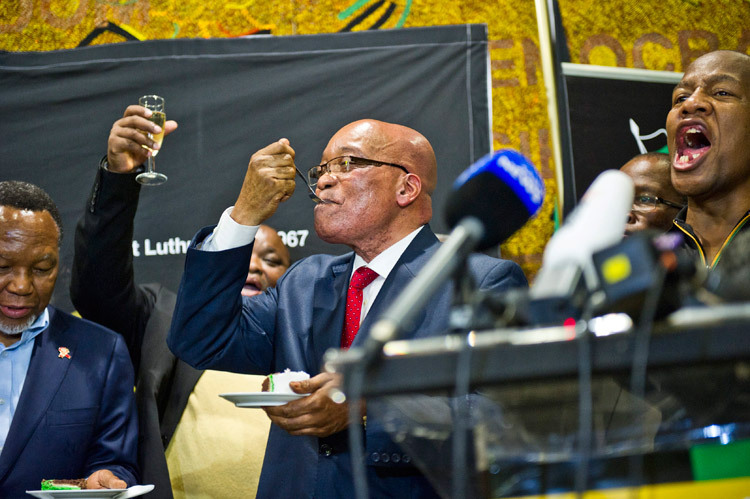 The move that ousted Mbeki and put Zuma in power at Pholokwane was the last major realignment that the “slate-democracy” of the ANC will ever deliver on a national scale. The ANC’s Mangaung conference confirmed that. It signalled the end of the glasnost the mass struggles of the late 80’s forced on the ANC and the return of the rule by the cabal of the Chief, King, Number 1, God. The Zuma cabal represents the big business 1% (personified by Africa’s richest Ramaphosa-Motsepe-Radebe clan), KZN nationalists (witness the overwhelming preponderance of KZNers in the cabinet), the military-police-intelligence axis (Zuma’s fortress and forte since his exile days as head of counter-intelligence, the ANC’s feared Mbokodo) and the Stasi-Stalinists of the SA Communist Party (Nzimande-Mantashe-Cronin) and their allies in mainly Cosatu’s public sector unions. It is a potent and toxic mixture whose uniting features are excessive pride and self-confidence, avarice and contempt for ordinary people and democratic processes. Even if the ANC’s membership has grown, the broad church it once boasted of is gone and with it any genuine democratic contestation of ideas and people inside the organisation. It is to Number 1 that comrades must pray if they hope to get ahead in the organisation. Patronage, paranoia, pecking orders and protection rackets are the order of the day. Comrades who resist end up being shown the door, punished, silenced or forced to reinvent themselves as an imbongi. The ANC’s tripartite alliance, the backbone of the national liberation struggle since the fifties, is also history. The SACP, dominant in the ANC leadership and cabinet, is the main battering ram of the Zuma cabal wherever worker and popular struggle erupts. There is nothing for the ANC to be in alliance with in the SACP, so embedded is it with the ruling agenda. It is the toy telephone for every atrocity of the state and its actual “independence” is only from the workers it claims to represent. The crisis in Cosatu is the result of the “big business-communists” determination to silence critical voices and turn the federation into their lapdog. If they succeed there will be nothing left of the industrial working class in Cosatu to be in alliance with. And if they don’t succeed, the “new” Cosatu will follow the lead of its biggest affiliate Numsa and want nothing to do with them in any event. Either way the Alliance is forever shattered. The ANC has already totally destroyed its youth wing. In the process it lost any credibility it had amongst the youth, the majority of SA’s population, and spawned the first serious challenge to its hegemony in twenty years in the form of Julius Malema’s EFF. None of the polls, research and experts have come anywhere close to grasping the huge impact the EFF is having on the ground. The ANC has managed to expand basic services, create 15 million dependents through social grants, a 5 million strong black middle class, a loyal public sector through privilege and patronage and considerable rural support by reinforcing the traditional authorities there. It will probably get a majority in the election because of this but also because the poor are loyal to the organisation which liberated them from apartheid, now long past its sell by date, particularly in the absence of a clear alternative. But it will be the last good story the ANC will tell itself. For the ground is shifting dramatically under its feet and alternatives are busy being born in the massive political chasm to the left of the ANC. A rising tide floats all ships. The unprecedented level, depth and intensity of struggles going on across South Africa, every day, have not only brought workers and the poor into direct conflict with the corruption, cronyism, incompetence and repression of the state time and again, it has also provided fertile ground for those discontented with the ANC to organize to fight back. In this interregnum, as Italian marxist Gramsci said, a great variety of morbid symptoms appear. Malema’s hypocricy, the SACP’s perfidy, Zuma’s family and friends and Ramaphosa’s baseness are just some of these morbid symptoms. wow, excellently written and observed, and very informative. thank you! Nothing turns a Socialist into a Capitalist as quick as a bit of money. In a time when SA needed a great leader (like another Mandela) we got an immoral hedonist. Then again, as somebody said “democracy is a system of government by which you are ruled no better than you deserve”. As die privaat seotkr, ofte wel die publike kapitaal genoegsaam uitgewis (vermors ) word dan kan hulle aankondig dat kapitalisme gefaal het en dat n kommunistiese stelsel geimplimenteer moet word. Hulle het dit al op Tv gese.Dit is waarom die anc nie skroom om miljarde te blaas nie, dink maar aan die sokker stadiums, Gautrein, tolhekke, krag , brandstof, ontwapening, grondhervorming, BEE en ander bedrog ens wat met die publiek se befondsing gedoen word en geen sent word terug gesit nie, alle opbrengste word elders heen gekannaliseer. Mense wat verarm is kan nie politieke weerstand bied nie.Die prentjie wat dit skep is dat die privaatsektor besig is om bankrot geforseer te word. Op n sekere vlak sal die enigste oplossing n harde diktatorskap wees en die blanke sal letterlik van honger omkom, die res sal vermoor word. Die Nguni sal terugkeer na waar hulle uit Afrika kom en die NWO sal die land se bronne na willekeur stroop onder toesig ban hulle VN wat toesig hou.Vir die’ mense wat dink die belasting geld wat jy betaal Dis nie eers n druppel in die emmer nie, hulle stel nie daarin belang nie, dis eerder n beslommernis.